The LIFEPAK 1000 has been designed specifically for rescue personnel yet is simple enough for inexperienced lay responders. Combining simplicity and ease-of-use with Physio-Control’s pack-leading technology, the LIFEPAK 1000 is an incredible defibrillator that may simply be the toughest and most durable on the market today. The LIFEPAK 1000 is the most rugged public access defibrillator designed by Medtronic's Physio-Control, having received an IP55 rating. For those unfamiliar with IP ratings, this means the LIFEPAK 1000 provides complete protection (limited ingress permitted) against foreign bodies, such as dust, while also providing protection against low pressure water jets. As a result of the LIFEPAK 1000 being able to withstand a serious beating in some of the world's harshest environments, the LIFEPAK 1000 is the defibrillator of choice among rescue professionals. Without a doubt, the LIFEPAK 1000 AED is the toughest public access defibrillator available. The LIFEPAK 1000 features Medtronic's ADAPTIV biphasic technology, which provides a range of therapy/energy up to 360 Joules. 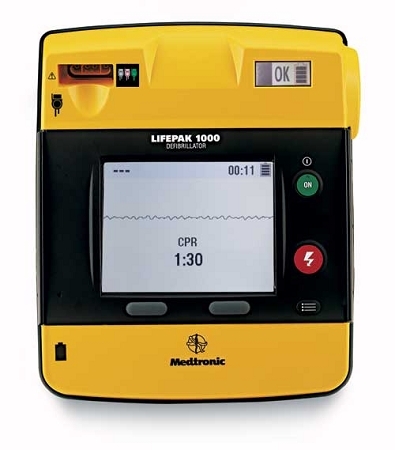 The first shock the LIFEPAK 1000 delivers is 200 Joules; should the first shock not revive the heart, the LIFEPAK 1000 then escalates its therapy to up to 360 Joules. In support of what rescue and health care professionals have long argued, the 2010 AHA CPR Guidelines now supports the escalating therapy method featured within the LIFEPAK 1000. Simplicity being key in emergency situations, the LIFEPAK 1000 also features a large and intuitive display screen for ECG readings and graphics, providing key and integral information in a clear and easy-to-read manner. 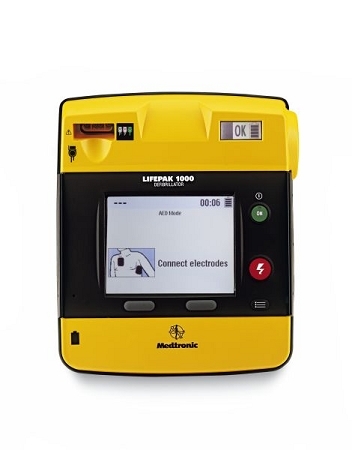 The LIFEPAK 1000 also features an accessible and visible battery gauge, giving you the ability to determine the battery life of the LIFEPAK 1000 with the simple touch of a button. The non-rechargeable battery of the LIFEPAK 1000 can deliver more than 425 shocks. The LIFEPAK 1000 is also equipped with Physio-Control’s cprMAX technology, which enables rescue personnel to change protocols as standards of care evolve. All in all, rescue personnel and lay responders alike will find a new favorite with the LIFEPAK 1000. A rugged design capable of taking a beating without jeopardizing functionality, a simple yet customizable functionality, escalating therapy up to 360 Joules, and much more. The LIFEPAK 1000 is the defibrillator of the future and the preferred defibrillator among rescue professionals worldwide. 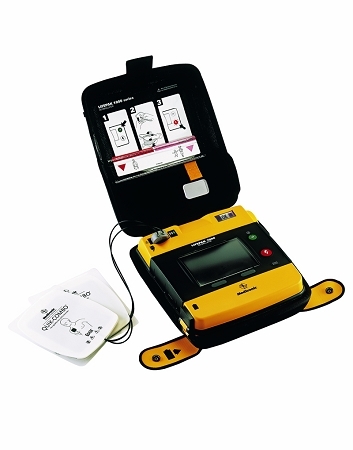 The LIFEPAK 1000 is the most powerful basic life support tool available. Medtronic and Physio-Control have created a truly stunning AED with the LIFEPAK 1000, surpassing the competition in a number of arenas.